Turkish Kebabs & Pizza uses their own specialised couriers to deliver their food. 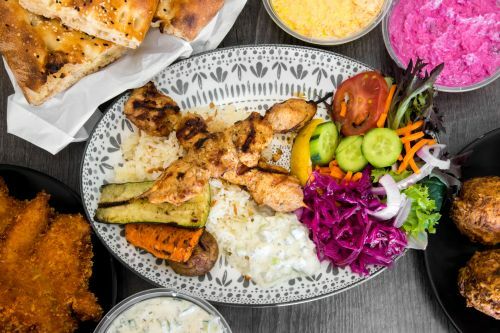 1 x Vegetarian Turkish Pide, 1 x Grilled Vegetables, 2 x Small Dips, 1 x Yesil Fusulye (green beans), 1 x Turkish Bread, 1 x Rice, 1 x Potato Balls, 1 x Salad. Chickpeas, tahini, garlic lemon juice and spices. Beetroot, yoghurt, garlic, dill and a selection of herbs. Carrot, yoghurt, garlic, and a selection of herbs. Eggplant, garlic, yoghurt, herbs and spices. Cucumber, yoghurt, dill, garlic, and fresh herbs. Fresh chilli, walnut, bread crumbs, garlic and spices. Crushed wheat, fresh parsley, herbs and spices. Vine leaves, rice, onion, parsley, herbs and spices cooked in olive oil. Pastry filled with spinach, fetta cheese and parsley. Grated fresh zucchini, fresh herbs, flour, egg and spices serves with garlic sauce. Pastry filled with marinated cooked mince, onion and parsleys. Potato, feta cheese mixed with parsleys, herbs covered with bread crumbs and deep fried. Chickpeas, broad beans, parsley, onion and spices with humus. Turkish pide bread infused with garlic and topped lightly with feta cheese. Turkish pide bread infused with garlic, fetta cheese, mozzarella cheese and herbs. Grilled marinated lamb skewers served with rice and salad. Grilled marinated chicken breast skewers served with rice and salad. Grilled Turkish meatballs served with rice and salad. Grilled marinated chicken breast served with rice and salad. Marinated chicken breast, topped with crumbs, deep fried, served with chips and salad. Tender beef pieces topped with tomato based sauce, served with Turkish rice, garlic sauce and salad. Grilled marinated prawns served with rice and salad. Grilled marinated lamb cutlets served with rice and salad. Lamb and chicken skewers, meatball, lamb cutlet served with rice and salad. Grilled hot & spicy marinated mince lamb served with rice, salad and yoghurt sauce. Tender chicken kebab pieces served with rice and salad. Marinated sliced tender beef kebab served with rice, salad and sauce. Fresh cooked Flafle served with rice, salad and mint sauce. Zucchini, olives, eggplant, mushroom, capsicum and feta served with rice and salad. A mix of onion, capsicum, tomato, olives, mushroom, spinach, potato, cheese and herbs. Roasted chicken pieces with cheese and parsley. Mince lamb, onion, cheese and parsley. Spicy Turkish salami, fresh tomato, onion, capsicum, cheese and parsley. Turkish smoked beef, onion, capsicum, tomato, cheese and parsley. Fetta cheese, pizza cheese, spinach and parsley. Potato, onion, parsley, cheese and herbs. Marinated lamb, fresh onion, tomato, capsicum and parsley. Marinated chicken in tandoori sauce with cheese. Marinated prawns, mushroom, garlic, onion, tomato, cheese and parsley. Fresh sliced mushrooms, olives, onion, tomato, cheese and parsley. Roasted chicken, mushroom, tomato with parsley and cheese. Roasted chicken, feta cheese with parsley and cheese. Chicken, spinach, tomato, herbs, feta and cheese. Turkish smoked beef, pineapple, BBQ sauce, cheese andparsley. Salami, spinach, capsicum, mushroom, herbs, chilli and cheese. Beef pieces, capsicum, mushroom, onion, BBQ sauce and cheese. Shaved chicken, meat and lamb with vegetable and cheese. BBQ chicken with BBQ sauce and cheese. Roasted Chicken, pineapple and cheese. Mix of Salami,chicken,lamb with onion,capsicum and BBQ sauce. Tasty cheese on tomato base bread. Turkish salami, egg, bbq sauce and cheese. Shaved beef, jalapeno, chilli, onion, capsicum and cheese. Lamb pieces, tomato, onion, capsicum, mushroom and cheese. Falafel served with salad, humus, tabuli and your choice of sauce, rolled up in flat bread. (Zucchini Ball Roll) Zucchini balls served with salad humus, tabouli and your choice of sauce, rolled up in flat bread. Seasoned sliced beef served with salad and your choice of sauce , rolled up in flat bread. Marinated sliced chicken served with salad and your choice of sauce, rolled up in flat bread. A mixture of doner served with salad and your choice of sauce, rolled up in flat bread. Grilled shish kebabs served with salad and choice of sauce, rolled up in plain bread. Grilled chicken shish served with salad and choice of sauce in Turkish bun. Shaved meat, rice and salad.